Here is an update to my running series documenting my collection of cameras. You can see the previous post here. I spent the morning running errands, on the way I hit up a few local thrift stores, they are always fun and sometimes they have good camera gear. The first stop at Savers was ok. They had a 55mm Canon lens, and a crappy zoom lens, decided to but Highlander on VHS instead. Next stop at the Goodwill was much better. They had this old Nikon EM with a 50mm f/1.8 Nikon lens, it also has a battery pack/motor drive attached, i had to have it. I don’t have a 50mm lens for my Nikon system yet, and since it’s the classic focal length i bought it up. Also had a cool battery pack for an off camera flash, but it was missing the charging cord, passed on that. The EM was marketed as an entry level SLR that only has an aperture priority mode to make use easy for the uninitiated. The camera body is fairly cheap and will likely sit on the wall, however, since Nikon never changed their mounting system (shame Canon) i put this beauty onto my Nikon DSLR and will be using it frequently. Good for you Taylor on your Nikon EM find. I once was a Canon camera user but now own a Nikon D40 and D80 for the simple reason of consistency. 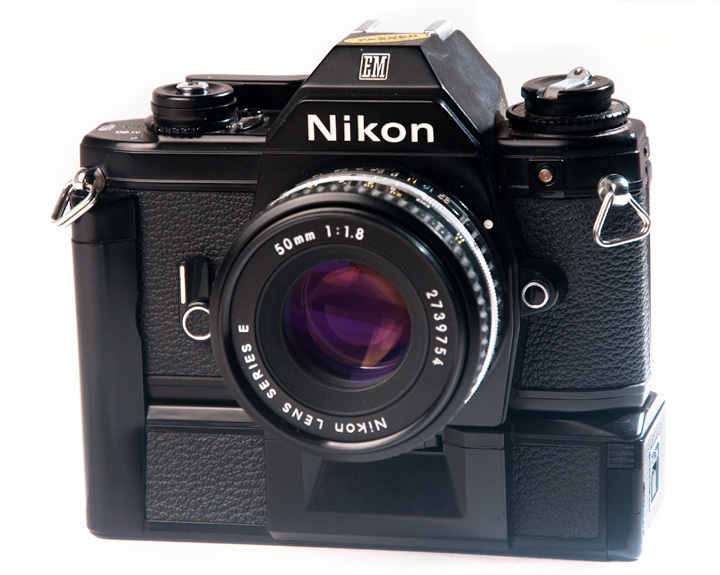 I like the idea of user older Nikon lenses with the Nikon digital cameras. Your shopping at the thrift store or flea market for old cameras is I’m quite sure enjoyable for you. My collection of old cameras I hope to display behind glass soon. Enjoy.